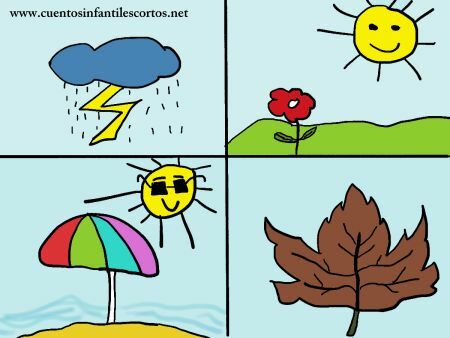 There were once four seasons in the year called Spring, Summer, Autumn and Winter. Each season was very different, but two of them didn’t get on very well at all. Which two were they? I hear you asking. Well, Winter and Summer, that’s who. From the moment they met, Winter and Summer had clashed, for Winter liked the cold, rain and snow, but Summer preferred sunshine, dryness and heat. In fact, they were polar opposites. So one day the four seasons got together to resolve the problem. Spring comes after Winter, and with her the trees and fields begin to flower and it stops being so cold. And Autumn, who follows Summer, brings with him the falling leaves, the start of the cold weather and a few rain showers. At their meeting, Spring and Autumn tried to explain to Winter and Summer that they should get along, for all four of them are needed to complete the circle of life on Earth. And that was how Spring and Autumn made Winter and Summer see that it is only by being united, and not standing against one another, that they can maintain balance on Earth.